To those who know me personally, you know my love for all things Costco. We’ve been members for years, I buy stuff in bulk – which we generally use up. How much do I love Costco? We recently ran out of Kirkland Signature brand paper towels….We just hadn’t had time to make a trip over there – our Costco is 20 minutes away from home. So, I ran to the corner store to pick up our old standby, a brand that I once loved. I was unimpressed with the old brand. Frank was so unimpressed that he said he was going to use the last roll of that other brand to start the grill. IT WAS SO BAD! Since then, I have vowed to not run out of our favorite Kirkland Signature anything! Did you know they have over 300 products and counting in their Kirkland Signature line? I can see a half dozen of their Kirkland Signature items in my kitchen alone! Have you tried those Milk Chocolate Raisins?!?! We recently changed to their laundry detergent and fabric softener too! That coffee?! So Delish! Those Raisins?! Trying to hide them from Syd?! The Granola Bars?! Perfect for Syd’s snack! So, naturally, when Costco asked me to be a part of the launch of another store in our area, I obviously said yes! On November 5, there’s another Costco opening in Menomonee Falls! I think their membership is well worth the money and if you join now, you’ll get an extra bonus! New Executive Members receive an annual 2% reward on qualified Costco purchases and a $20 Costco Cash Card. New Gold Star and Business Members receive a $10 Costco Cash Card. It’s become clear to me that we haven’t been using our Costco membership to the fullest. Did you know that Costco has an amazing line of services too? They have little things like Water Deliver and big things like Mortgage Purchase and Refinancing. They also have Business services for your business and things for your life, auto and health insurance! To celebrate the opening of another Costco in our area, let’s have a giveaway! Rules for the giveaway are as follows: You must pick up your winnings at the Menomonee Falls store which opens on November 5, 2015. Giveaway ends October 19 as 12:00am. Winner will be notified via email left in comment. 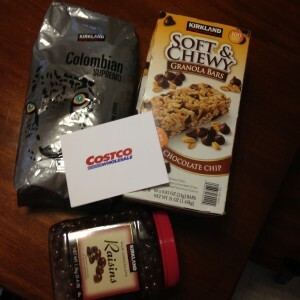 Disclaimer: I have received products from Costco for posting about their new store. Opinions about Costco are my own. Totally! I love supporting a company who treats their employees well! We love Costco!! Can’t wait to have a couple more so close by. We LOVE their fresh baked pizza. This is great, thanks Jess! I LOVE Costco. It has become our Saturday family outing. We buy what we need then stop at the food court for lunch. We love their smoothies from the food court! What’s not to love about Costco? I love it all! What’s not to love is right!!! Now that there will be one close to us in the Falls I think we’re going to join! I can’t say anything bad about it!